Fr. 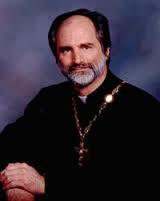 Thomas Loya is pastor of Annunciation of the Mother of God Byzantine Catholic Church in Homer Glen, Illinois. He is host of two radio programs, “Light of the East” heard on the EWTN radio network and “A Body of Truth” which is broadcast by internet. (You can find it here.) Before entering the Seminary he earned a degree and pursued a career in Commercial Art and Design after which he worked for a church design firm. He completed his studies for the priesthood in Pennsylvania and Rome and was ordained a priest in 1982. In 1993, he earned a Masters of Fine Arts in Counseling and Human Services. He has worked on iconography and has served in youth and young adult ministry and is currently the Eastern Church spiritual adviser. He blogs at Tabor Life.